Gandhi knew something that the social sciences keep looking to find. Carl Rogers knew to BE happy we must be in a state of congruence. 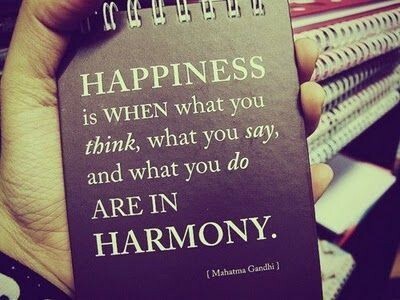 Congruence is derived from a Latin word meaning HARMONY. I think I first learned this concept from my Mom. "Say what you mean and mean what you say". I question if I really understood then but I dO now. It is a really good idea to live your life in alignment to YOUR Values and Beliefs. It takes courage to be honest. It can be hard to see the truth. To Be. Authenticiy is another word. same idea. Are you TRUE to your own Spirit? Shakespeare gets credit for a super cool line. "To thine own self be true". Shakespeare lived a long time ago. I guess Decieiving yourself happened in the 1600's. Socrates is known for teaching "Know Thyself". HE lived 400 BC. Everyone knows to teach kids to be honest. Right? The Apostle Paul spoke a bunch about hypocrisy. CHRIST explains that the truth can set us free. I believe.